This past semester, I started thinking a lot about my approach to writing center work. We were remarkably busy this fall, and I’ve tried to think about ways to help my consultants manage the volume of work we’ve seen. However I try to think about it, I always seem to come back to one idea for approaching a session. 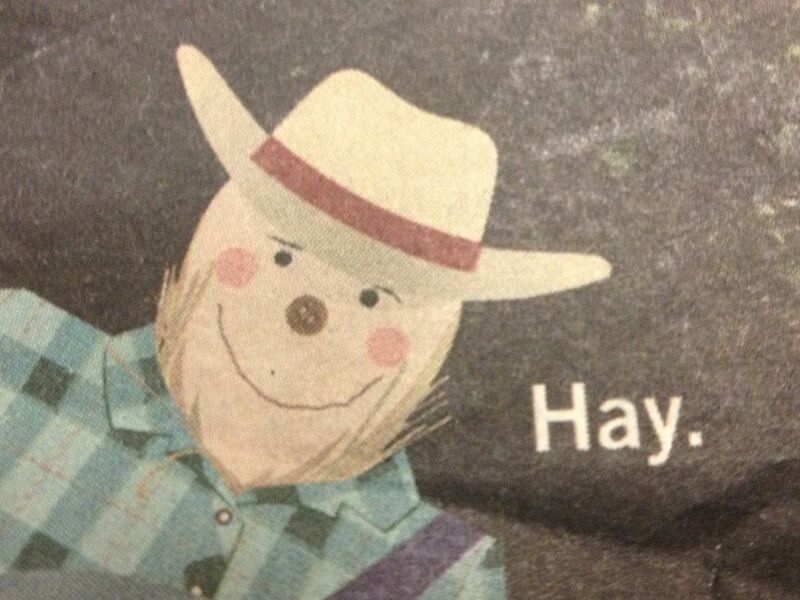 I have a picture on my desk of a scarecrow in overalls and a cowboy hat with straw coming out of his shirt. The only word on the photo is “Hay.” A friend gave me this as an inside joke, and I can’t think of an item on my desk that would say more about my personality. The country scarecrow, the jaunty angle of his hat, and the simple, expressive declaration all represent me, and my writing center work, in a subtle and unique way. I began working in writing centers in 2002, and I had no clue what I was doing or what to expect from my work. Unfortunately for the students, the center focused on a very prescriptive way of teaching grammar and shied away from exploring content. This was the only way I knew to tutor, so I went with it, but, looking back, I’m aghast at how much I did for the students I worked with. Students, and clients, should do the majority of the work in the session, I’ve learned this now. I believe in a very open-ended, client-centered, and laid back session. I don’t mean to project an image of me as an all-knowing consultant, sitting with her arms crossed refusing to “give answers.” What I envision myself as, instead, is the scarecrow on my desk. Scarecrows are supposed to scare away predators from a helpless object (crows and gardens). My writing center scarecrow persona assumes the outward impression of a scary being, a view many clients have of writing centers and consultants; however, that’s not really what we are or what a scarecrow is. In actuality, scarecrows, much like UWC consultants, are harmless—they are just perceived as a threat. Scarecrows are unassuming and relaxed. They are intentional, and the one on my desk is happy. When I approach a session, no matter the client, I try to approach it in this way—relaxed, happy, unassuming, and intentional. If a client can look past the scary exterior, they will have a fruitful and productive session, and might even come back. Every time I look at the scarecrow on my desk, I get a little kick of joy, not only because of it’s sentimental value to me. The scarecrow also represents so much about my philosophy and me that glancing at it and keeping it near reminds me of my writing center purpose—to be friendly, unassuming, relaxed, and intentional.